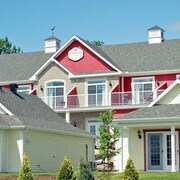 Situated on the waterfront, this spa hotel is steps from Missisquoi Bay Golf Club and Lake Champlain. Venise-en-Quebec Beach is 0.8 mi (1.3 km) away. 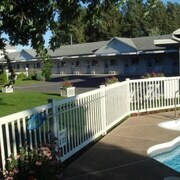 Great place to get away for a night, pool was good; water quality needs to be improved. Where to find Lacolle hotels near an airport? 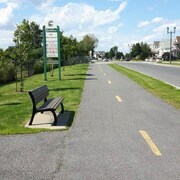 Where can I find hotels in Lacolle that are near tourist attractions? Considering there's only 1 Expedia-listed hotel option within a 0.1-kilometre (0.06-mile) radius of Lacolle's heart, it makes good sense securing your room well before you fly. 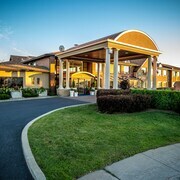 The nearest Expedia-listed hotel is the Holiday Inn Express St. Jean Sur Richelieu, Quebec, which is 30 kilometres (19 miles) from the heart of Lacolle. Another option is the Relais Gouverneur Saint-Jean-sur-Richelieu, in Quebec, 30 kilometres (18 miles) from the middle of Lacolle. 9 kilometres (6 miles) from the middle of Lacolle, is the Hotel St. Bernard. 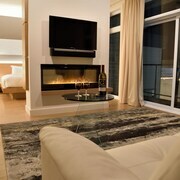 Alternatively, the Motel Iberville is situated 30 kilometres (19 miles) away. 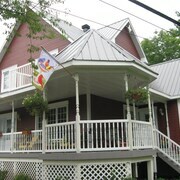 The Motel Belle Rivière as well as the Motel Montgolfière JP are some other Expedia-listed accommodations around Lacolle. After seeing Lacolle, schedule in a little time to discover the other attractions in the Montreal - Monteregie area. Photographers will love Montreal - Monteregie's forests, rivers and lakes. You could also visit some of the region's old towns, churches and cathedrals. Common activities in this part of Canada include skiing, cross-country skiing and ice skating. Looking for more things to do? Why not spend some time exploring Notre Dame Basilica and Saint Joseph's Oratory, in Montreal, 50 kilometres (31 miles) to the north of Lacolle. The Auberge de La Fontaine and Ritz-Carlton, Montréal are some of the fabulous Expedia-listed lodging options in Montreal. Alternatively, you could consider staying at Saint Laurent Boulevard, 55 kilometres (33 miles) to the north of Lacolle, where you can pick from the Hotel Le St-James Montréal and W Montreal. The L'ile Notre -Dame Beach and Olympic Basin are just a couple of the more popular points of interest to experience when you're in Saint Laurent Boulevard. If watching sport is what you love, take the time to visit Olympic Stadium, which is 55 kilometres (35 miles) to the north of Lacolle. Sleep nearby to the action at the Loft Hotel or the Auberge Le Pomerol. Plattsburgh International Airport can be found 45 kilometres (28 miles) away from Lacolle. Visitors who wish to stay nearby, you can easily book a night at the Comfort Inn And Suites or the Holiday Inn Plattsburgh - Adirondack Area. Are there hotels in other cities near Lacolle? 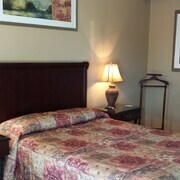 What other types of accommodations are available in Lacolle? Explore Lacolle with Expedia.ca’s Travel Guides to find the best flights, cars, holiday packages and more!